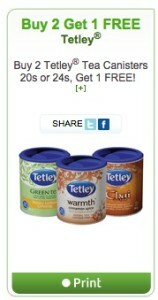 Tetley coupon is valid only in Canada and anywhere where they accept printed coupons. I’ve used printed coupons at Shoppers, Loblaws, Metro, No frills and Walmart without any problems. 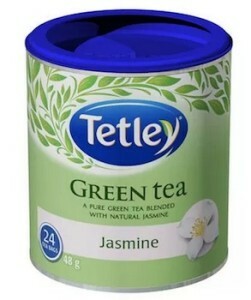 etley Jasmine Green TeaRevel in the aroma of green tea blended with sweet jasmine flowers. Smooth and sophisticated, Tetley Jasmine Green Tea delights your taste buds with every unforgettable sip. A little info about jasmine; the blossoms of the jasmine plant are usually very fragrant. These blossoms are what make each cup of tea an aromatic delight. You can find Tetley Tea at Walmart for $3.97.